On a recent visit to the Chamber's Bay Golf Course in University Place, Washington, I walked out on the newly opened footbridge to the beach and looked south toward the historic town of Steilacoom. The morning fog was still hanging low in the sky hiding the sunshine that was to come later in the day. I snapped a few pictures and was inspired to paint the scene when I got home. This 9x12 inch oil painting is the result. If you have a chance to visit the site, definitely take it in. It is one of the most beautiful locations in Pierce County. Fall is upon us! Sunny days and cool evenings are warning that winter is around the corner. 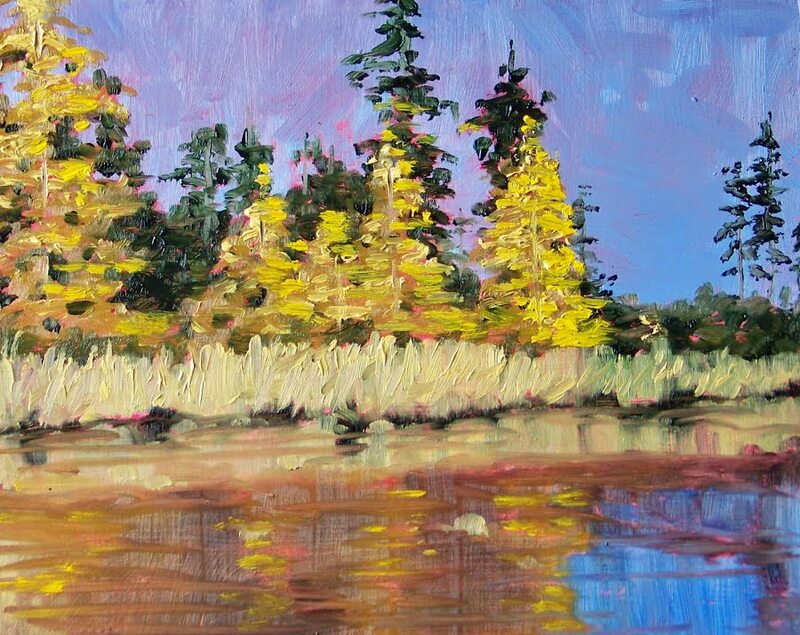 This painting of an autumn riverside was added to my Etsy Gallery today. Click here to view it in the gallery. It is apple harvest time. Time for cider presses and pie. There's nothing like the crunch of a fresh apple to inspire a painting. 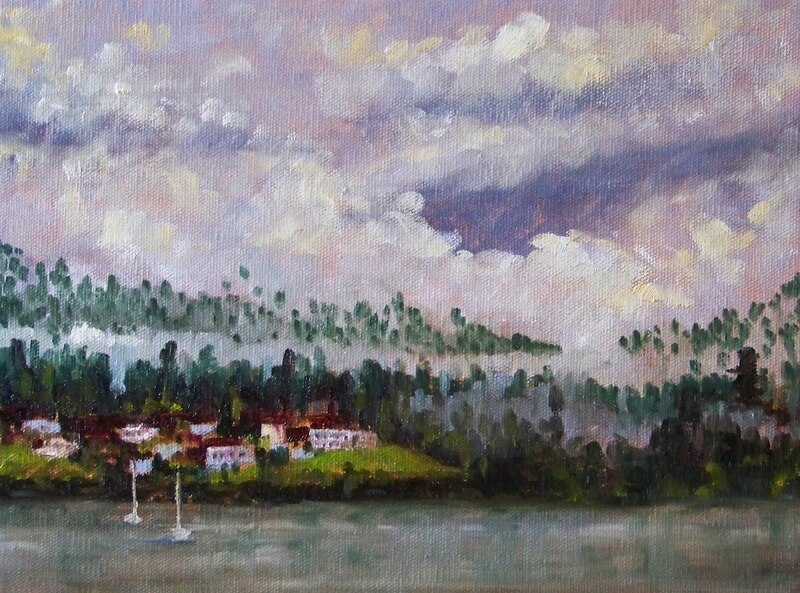 This one is 8x8 inches on a gallery-wrapped stretched canvas. I listed it in my Etsy Gallery, Small Impressions Paintings, this evening. 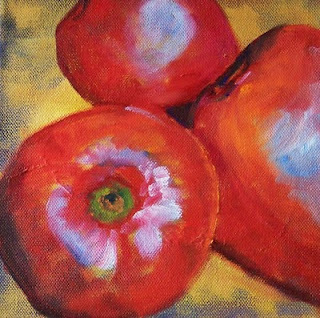 It can be viewed in the gallery along with some of my other small fruit paintings. Click here to view it in the gallery. Here's my first self-portrait. It is 4x6 inches, not quite life size. 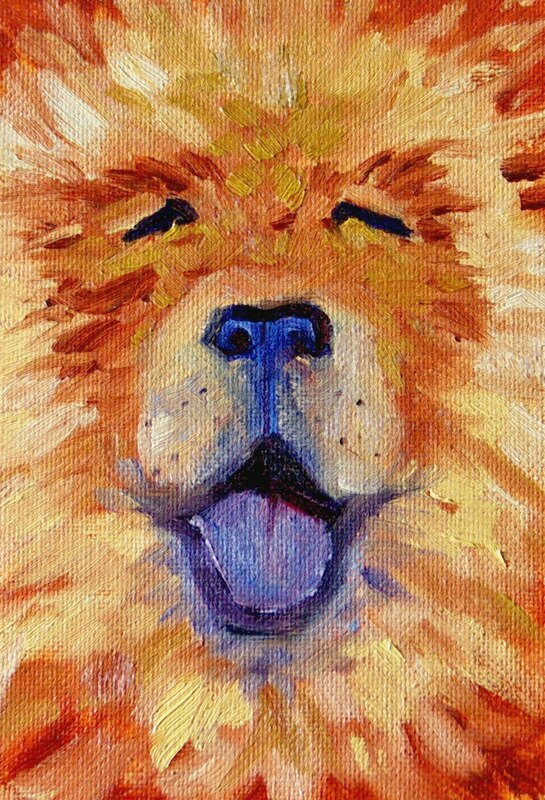 I can't resist painting these little nose portraits. I may have to put a few of in the Quick Studies section in my Etsy Gallery, Small Impressions Paintings. Until then, I'm just having a lot of fun improving my skill and creating little abstract portraits. Several months ago when my old computer died, I thought most of my reference photos had died with it. Thankfully I was wrong. The fact that I had backed them up on a portable hard drive had been forgotten until I opened a drawer in the guest bedroom and saw that hard drive I had forgotten sitting there in the drawer. I plugged the hard drive into my new computer and there they were, my photos. It was from my old photos that this little painting emerged. I was attracted by the coolness of the little white house sitting under a canopy of trees and was excited to find my old references. The painting is 5x7 inches on a gessoed hardboard panel and has SOLD. The weather is cold and damp and the green grass of summer has all turned brown. 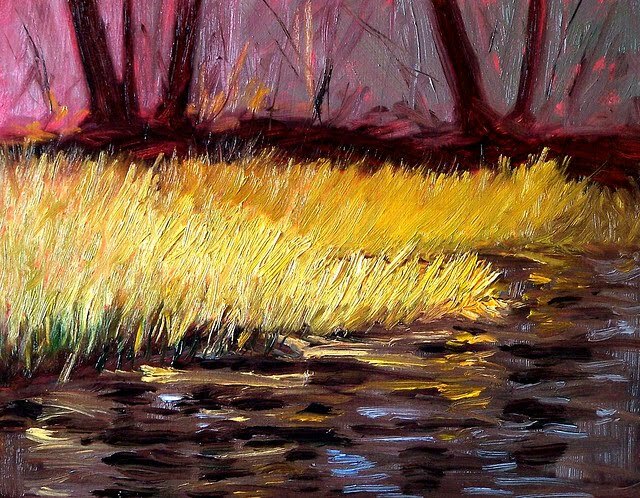 Today's painting reflects autumn marsh grass and the colors of fall. The grass was fun to paint in heavy impasto. The painting is 8x10 inches on a hardboard panel and is for sale at Small Impressions Gallery. Click here to view it in the Gallery. 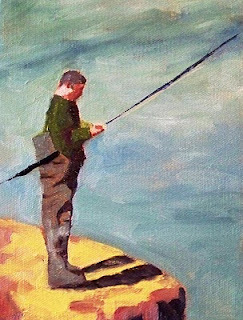 Today's painting celebrates fishermen who are casting their lines into Pacific Northwest rivers and hoping to haul in a salmon. When I was younger I spent many seasons stalking the rivers of Washington State with my father and angling for the big one. More often than not, I came home empty handed, but it gave me a real appreciation for the skill and expertise required to hook those ellusive fish that squirm their way up the rivers each fall. This painting was completed in oil on a 6x8 inch stretched canvas. 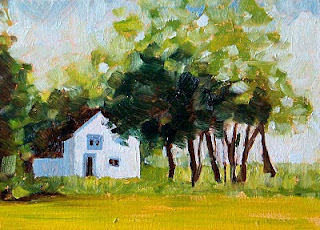 It will be joining some of my other quick studies at the Small Impressions Gallery on Etsy when the paint has dried. This is Bernie, a Chow Chow I met recently at the dog park. He is a furry ball of hair with a blue tongue--not black, but blue. It isn't just my choice of color, but his tongue was really blue. His face was so furry, it was hard to see his eyes. I was so enchanted with Bernie that I had to snap a picture. Then I had a lot of fun painting his mug. 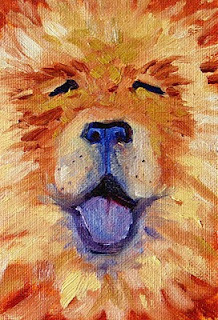 The painting was completed with oil paints on a 4x6 canvas panel. He sold through my Etsy Gallery, Small Impressions Paintings. Yesterday I took a wonderful bicycle ride that paralleled the Carbon River in Washington State. When we headed up the trail, the sky was gray and few people were about. Then, as we approached the portion of the trail near the river, people carrying fishing poles were everywhere. As we passed the river, fishermen were standing shoulder to shoulder. I remember one man climbing up the bank with a big salmon hanging from each hand. As the scene unfolded, I cursed myself for having left my camera at home. Although this ride is one of my favorite, I have photographed it hundreds of times and with the gray skies I decided there would be nothing new. I was so wrong. As we pedaled slowly forward, enjoying the action, the sun came out. It was the most gorgeous morning and I cursed my lack of camera again. 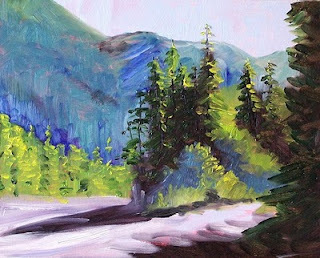 When the trip concluded and I was home again, I recalled this painting of the river from a previous trip. The painting is an 8x10 inch oil painting on a hardboard panel. It is a favorite of mine and is now for sale at my Etsy Gallery. View it in the gallery here. I'm still having fun with noses. The variety of shapes, the color of the skin, and the elements that are part of our features are much more diverse when one starts looking close enough to paint. 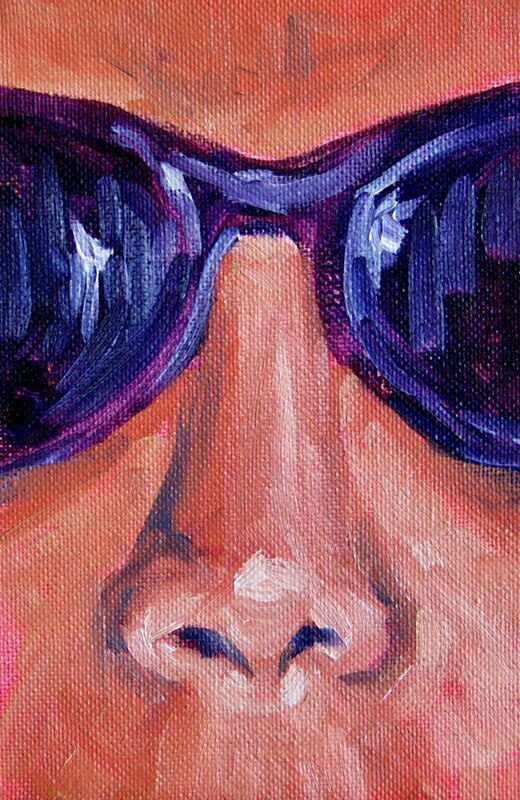 This painting was completed with oil paints and is 4x6 inches on a canvas panel--just about life size. 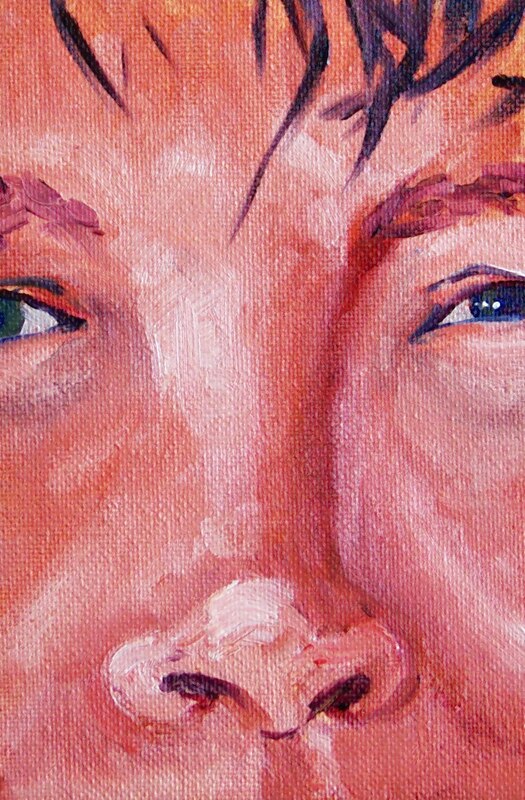 Today's painting is another one of my practices painting the nose. 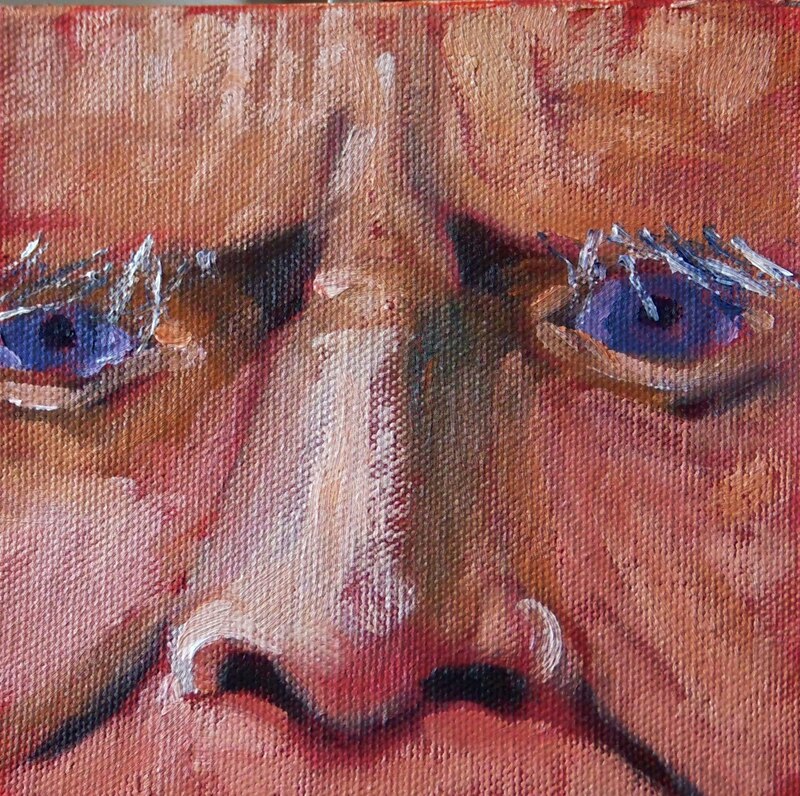 When I painted this guy I was struck by the tension that was on his forehead and his long wirey eyebrows. Getting up close and focusing on just a part of his face is a great exercise. Now I am busily cropping all my photos so I can concentrate on noses. It is amazing how even a nose in isolation can still express intense emotion. I hope you are enjoying viewing these little nose specimen as much as I am enjoying painting them.